Map of East Edan for Elex. Missions, NPCs, Quests, Teleporters, Trainers, Traders, Monsters, Items, Secrets, Hints, Locations ELEX Walkthrough, ELEX Maps, ELEX Guide & Wiki. 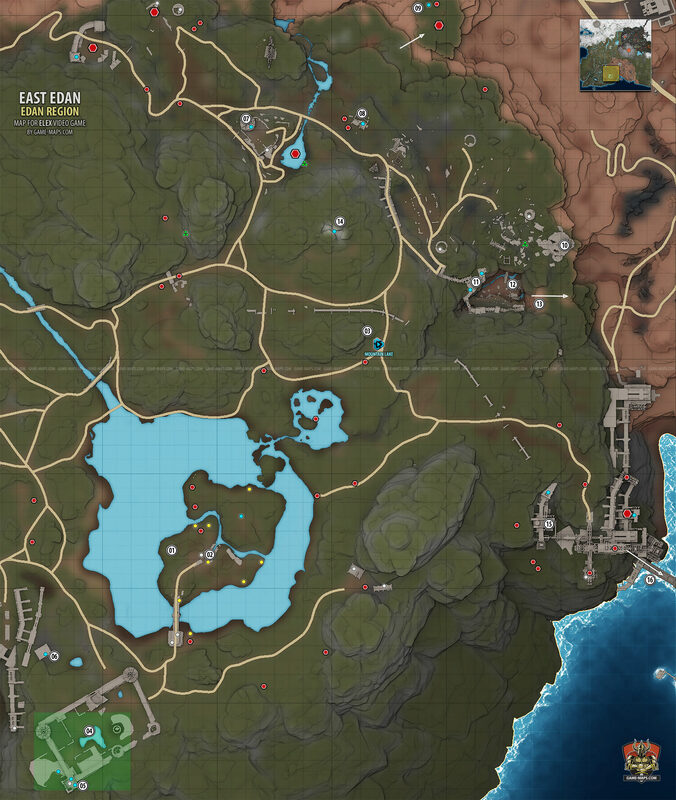 East Edan Map for Elex. You have to pick up 8 Mature Healing Roots. You can pick them up almost without fight, but 2 of them are near big monster so run fast and use Jet Pack, he is quite slow. Edan has been changed by the Berserkers to become a perfect place to grow all kinds of plants. The Berserkers are growing healing roots and Seedlings among other things. Ignis Artifex - very nice 2H Sword, but now beyond your skills. Go down the stairs, pick up Items and shards. Just jump from above. You can meet friendly Clerics there.